The Port of Hood River sells parking passes for the Event Site and the west Jensen Beach recreational parking lots on a seasonal and daily basis. There are passes available for Regular Length Vehicles (up to 22 feet) and for Over-Length Vehicles (over 22 feet). (Overlength vehicles are not allowed in the west Jensen Beach lot). Beginning Friday May 24, daily passes and full-price season passes can be purchased at the Event Site parking booth or the Port office. Visa and Mastercard are accepted at both locations. The online pre-season discount sale of parking passes will begin April 1, 2019 and continue through May 22. Scroll down to select the correct pass for your vehicle size. These passes ARE NOT VALID FOR ON-STREET PARKING. For more information about new paid parking on Port-owned areas of the waterfront please visit the Waterfront Parking page. Seasonal parking passes are TRANSFERABLE, but they are not refundable or replaceable. They are valid for the vehicle in which they are displayed and must be displayed at all times while the vehicle is parked at the Event Site, Lot #1 when opened for overflow parking, or the Jensen West Beach lot (Parking Zone 5). Pre-season parking passes can be mailed to you within the U.S. with an additional charge for postage, or they can be held for pick up in WILL CALL at the Port Offices until May 22. WILL CALL pickup at the Event Site parking booth begins Friday, May 24. Please bring photo I.D. and your receipt for pick up. Local will call pick up is recommended. Passes will not be mailed internationally. The Port is not responsible for passes lost in the mail. Passes are non-refundable and lost passes will not be replaced. For more information please call (541) 386-1645 or email porthr@gorge.net. 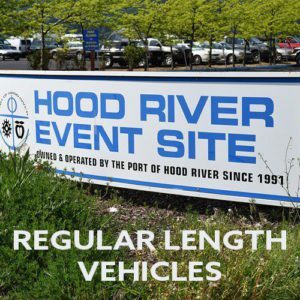 Parking Pass for vehicles up to 22 feet long at the Hood River Event Site and the Jensen West Beach lots for the 2019 Season. This pass is also valid in the Lot #1 overflow parking area whenever open. These passes ARE NOT VALID FOR STREET PARKING. Parking passes are TRANSFERABLE. They are valid for the vehicle in which they are displayed and must be displayed at all times while vehicle is parked at the Event Site, Lot #1 when opened for overflow parking, or the west half of the Jensen West Beach Lot (Parking Zone 5). Discounted pre-season sales will begin April 1, 2019 and end on May 22. 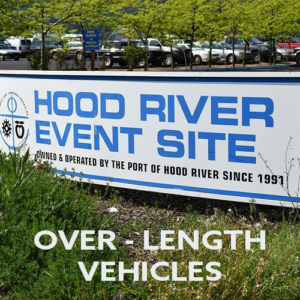 Beginning Friday, May 24, you may purchase a parking pass at the full price ($125) at the Event Site parking booth or in the Port office at 1000 E. Port Marina Drive, Hood River. Pre-season parking passes can be mailed to you within the U.S. with an additional charge for postage, or they can be held for pick up in WILL CALL at the Event Site parking booth beginning Friday, May 24. Please bring photo I.D. and your receipt for pick up. The Port is not responsible for passes lost in the mail. Passes are non-refundable and lost passes will not be replaced. For more information please call (541) 386-1645. 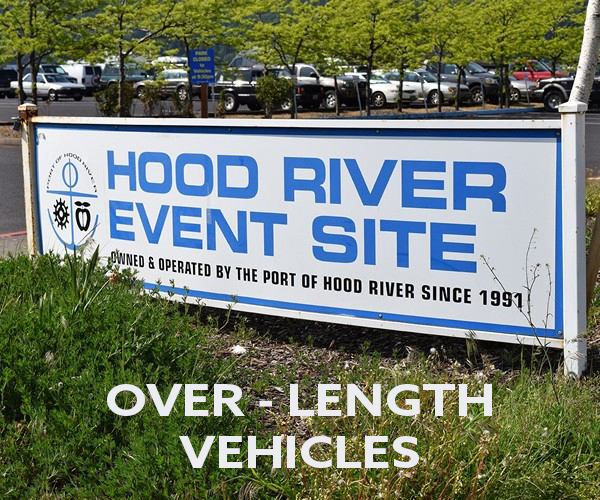 Parking Pass for over-length vehicles (over 22 feet long) at the Hood River Event Site for the 2019 Summer Season. This pass is also valid in the Lot #1 overflow parking area whenever open. These passes ARE NOT VALID FOR STREET PARKING AND NOT VALID IN THE JENSEN WEST BEACH LOT. parking passes are TRANSFERABLE. Overlength passes are valid for overlength vehicles only, parked in spaces marked for overlength vehicles. The pass is valid only for the vehicle in which they are displayed and must be displayed at all times while vehicle is parked at the Event Site, or Lot #1 when it is opened for overflow parking. Discounted pre-season sales will begin April 1, 2019 and end on May 22. Beginning Friday, May 24, you may purchase a parking pass at the full price ($200) at the Event Site parking booth or in the Port office at 1000 E. Port Marina Drive, Hood River.